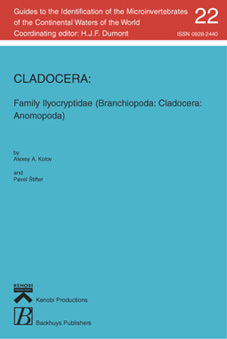 The Ilyocryptidae Smirnov, 1971 emend Smirnov, 1992 (Branchiopoda: Cladocera: Anomopoda), with the single genus Ilyocryptus Sars, 1862, are a compact, highly specialized group of Anomopoda (Crustacea: Branchiopoda), currently including 46 formal taxa at the species-group level, published and available according to the ICZN (2000). In our understanding, these include 28 valid species, some of which are separable into well-defined, discrete subspecies. Some representatives of this family are relatively frequently recorded in publications on the littoral fauna of freshwaters. The main problem confronting an investigator of Ilyocryptus is, frequently, the limited material available for study. Only a minority of species of the genus are common components of the mesobenthos of lakes, man-made reservoirs, rivers, bogs, and pools. For example, I. spinifer is present in the majority (if not all) of eutrophic tropical water bodies! The absence of this species from the faunistic lists given by investigators for any tropical region is a consequence of inadequate collecting methods rather than true rarity. Ilyocryptids are numerous, and sometimes dominant in the profundal of many large rivers and water reservoirs of the temperate zone, where they are frequently found at depths of 50 meters and more (Behning, 1941; Chirkova, 1984). Few species (I. spinifer, I. agilis) occur in the plankton, where they may, however, reach significant numbers (Williams, 1978). The first taxon ever discovered, I. sordidus Liévin, 1848, was described under the name Acanthocercus. Liévin’s (1848) description was characteristic of its time: he used characters that are inapplicable today, accompanied by pictures of the animal at almost natural size. The second page in the history of study of the genus was opened by Sars (1862a, b), who created the genus Ilyocryptus Sars, 1862, redescribed I. sordidus, and discovered a new, quite well defined species, I. acutifrons. Subsequently, he also gave the best examples of anomopod descriptions of his time, including good quality pictures of ilyocryptids from different regions of the world (Sars, 1888, 1896, 1901, 1909, 1916). A significant contribution to the systematics of the genus was made also by Herrick (1882a, b, 1884), Kurz (1878), Lilljeborg (1901), and Romijn (1919). On the contrary, inadequate and inaccurate descriptions of new species and variations by other authors (Brady, 1886; Arévalo, 1916; Bergamin, 1939) only led to more mistakes. From the beginning to the middle of the 20th century, all interest in the systematics of the genus Ilyocryptus was lost. All forms from different continents were determined by a majority of authors using only five names: I. sordidus (Liévin, 1848); I. acutifrons Sars, 1862; I. agilis Kurz, 1878; I. spinifer Herrick, 1882 and I. brevidentatus Ekman, 1905. Many misidentifications were revealed after our re-study of the samples examined by these authors, which, fortunately, had been deposited in museum collections. Only after publication of the book by Smirnov (1976), did it become clear that the diversity of ilyocryptids had been greatly underestimated. In addition, Smirnov raised the Ilyocryptinae to the level of a separate subfamily within the family Macrothricidae Norman & Brady, 1867, accommodating the sole genus Ilyocryptus. This book stimulated several authors to embark on some more detailed investigations of the genus (Williams, 1978; Kor ̌ínek, 1984). Among them was Chirkova, who summarised the results of her investigations on the biology of different species in 1984. In the late 1980s, a new revision of the systematics of Ilyocryptus started (Štifter, 1987, 1988, 1991; Gündüz, 1990, 1996; 5 Paggi, 1989, 1992; Kotov & Timms, 1998; Kotov & Dumont, 2000). It has yet to come to an end. Finally, Smirnov (1992) raised the former subfamily to full family level. This family, the Ilyocryptidae, was almost immediately accepted by today’s authors (Dumont & Silva-Briano, 1998; Negrea et al., 1999). In summary, we can confidently say that the species diversity within the genus Ilyocryptus remains underestimated and that a series of new species will be discovered and described, as revisions of some species groups will progress in the future. This book is therefore an attempt to summarize available data on the systematics and distribution of all currently known species of the genus. In particular, we here propose a key for species identification to hydrobiologists interested in turning their attention from the simplified planktonic communities to the more complex and species-rich littoral.